The category “Quarterly Picture” of Eye Floaters (Mouches volantes) in the newsletter „Holistic Vision“ introduces realistic, artistic, and/or spiritual/religious representations from different cultures and times which could show entoptic phenomena, or be inspired by it. In this issue: Entoptric Art from Salvador Dalí. 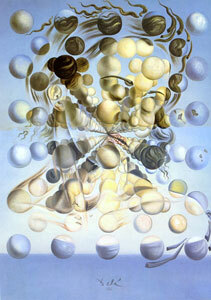 Galatea of the Spheres, 1952, oil on canvas, 65 x 54 cm. (source). The surrealism of the 20th century is an art school which connects and defamiliarizes the appearances of everyday life with a “super-real”, dreamy or hallucinatory reality. The surrealistic reality opinion is inspired by psychoanalysis and holds that there is an unconscious stock of images which the artist tries to release, sometimes by means of trance and hypnosis in the process of “free association”. In some cases, this promotes the occupation with entoptic phenomena, as art historian Ana Iribas stated. As such, for example, Salvador Dalí (1904-1989) was one of the most original and droll representatives of the surrealism. His charming “Galatea of the Spheres” consists of a variety of spheres. Like the spheres of the eye floaters structure, these spheres float, partly loose and without recognizable order, and then again following a solid and intuitively recognizable pattern. The depth dimension of the image becomes evident through the arrangement of the spheres for a vanishing point (the right corner of Galatea’s mouth). Obviously, the depth dimension does not have an effect on Galatea’s face, though, which seems to appear on the surface of the structure, solid and volatile at the same time. Dalí expresses here what also becomes obvious through an ecstatic open eye meditation of eye floaters: that our perceptible world only seemingly has substance, that we mostly look just at the surface of things, that reality consists of dynamic spheres, and that the volatility of the material phenomena will become obvious the more we concentrate on the spheres of this structure.